Resident Evil movie `licker` character with mouth opening around visor. Some nice detail work close up. 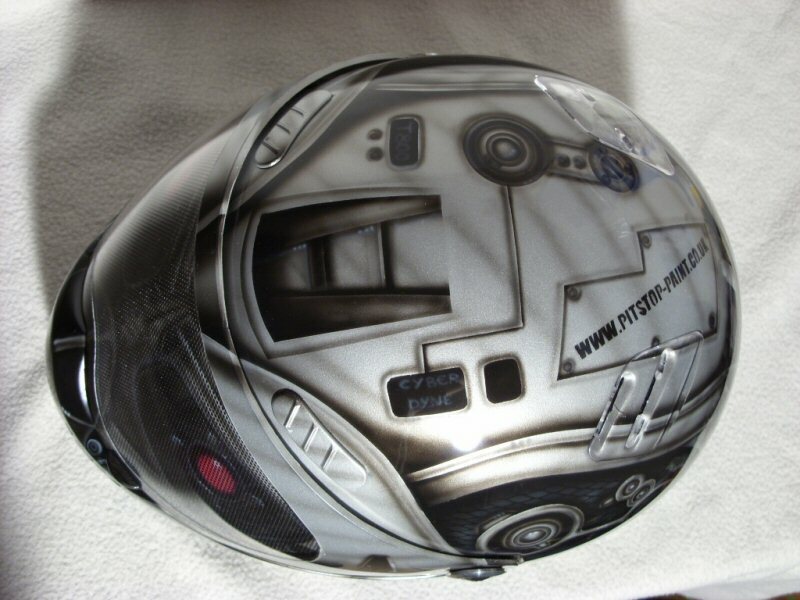 Star wars themed helmet featuring multiple mural work across the whole surface. 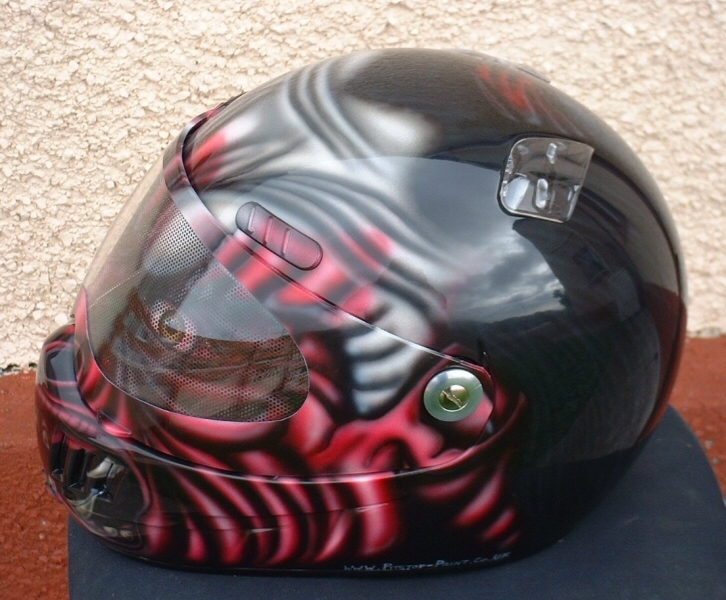 Especially awkward being a flip front helmet with spoilers, bluetooth and lots of sliding vents, etc. Lots and lots of detail close up through the murals and background for a real visual feast close up. Race design based around customers rough initial idea and evolved by myself with little artistic touches, etc. Bio mechanical/aircraft style theme with lots of 3D effects and detail work not to mention 2 very detailed large murals on the sides. 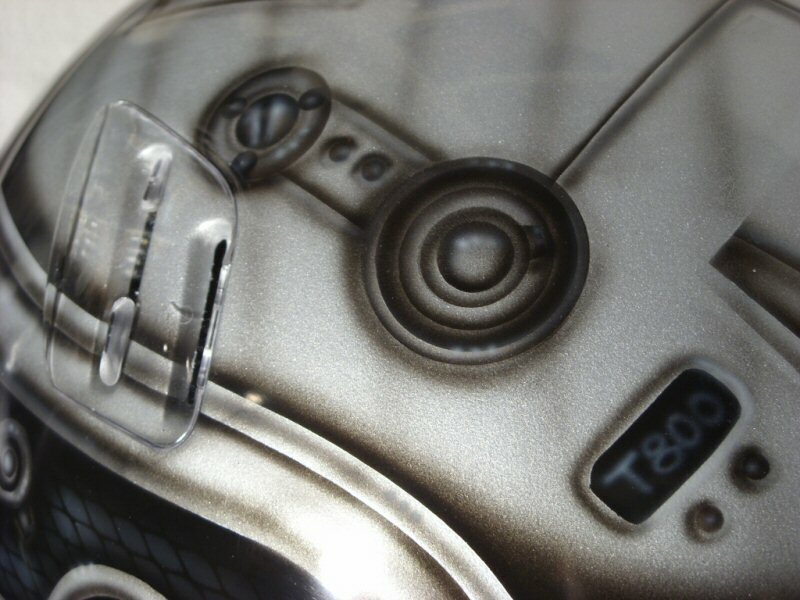 A lot to this helmet close up. 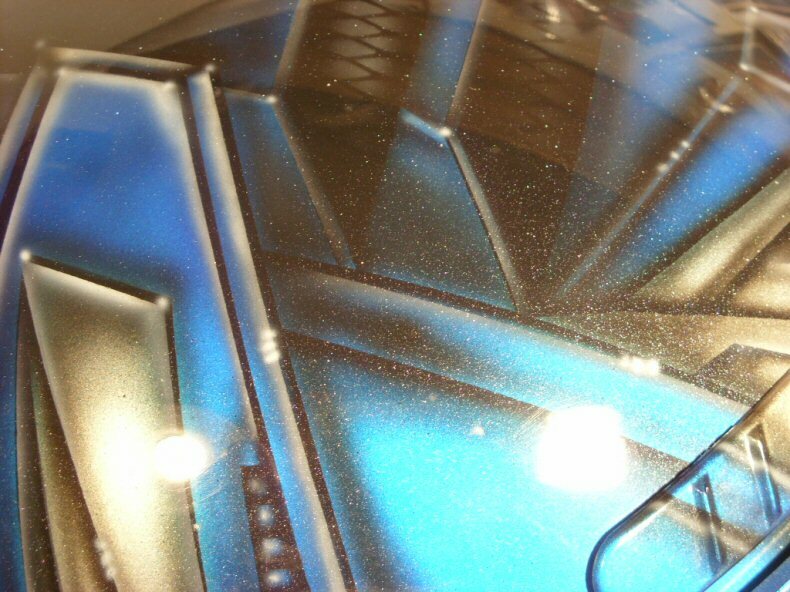 8 Different detailed murals/portraits across the whole surface of the helmet featuring scenes from the movie. Flying bullet and bullet holes, etc too. 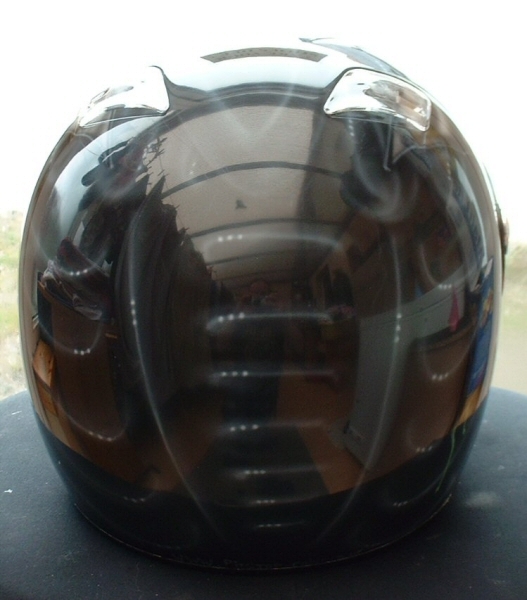 A lot of hours in this helmet reflected in the high price. Guardians of the galaxy movie themed helmet featuring very detailed murals either side with 3D tribal framing and wrapping round the whole helmet. Lots and lots of detail work close up. 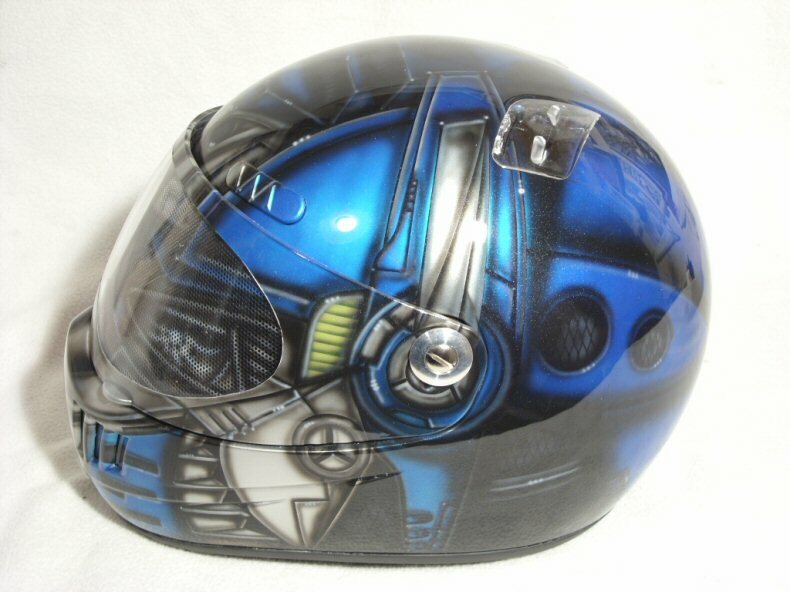 Put a huge amount of hours into this helmet as evident in the high price. Real labour of love this one pushing the limits of small scale work inthe murals. Each persons portrait for example is the size of my thumbprint or smaller. 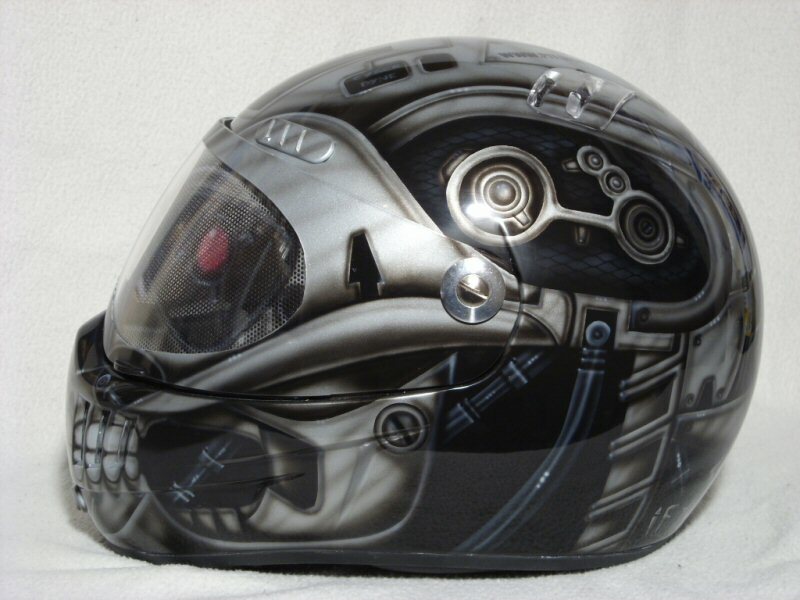 Sons of Anarchy tv show themed helmet featuring very detailed mural wrapping round the whole helmet. Lots and lots of detail work close up. 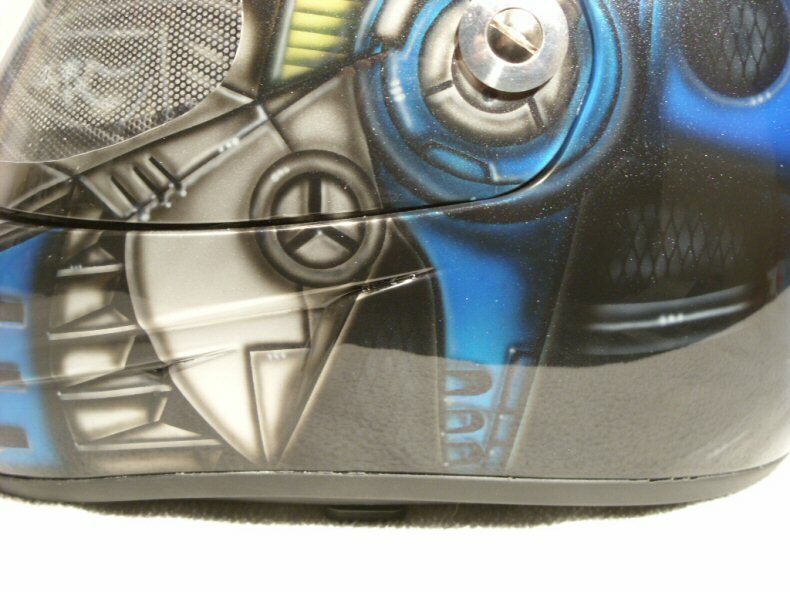 Batman themed helmet featuring very detailed mural wrapping round the whole helmet. Lots and lots of detail work. Coloured in candy blues to give a very gothic subtle look from a distance. Not a movie theme as such, but a celebirty none the less. 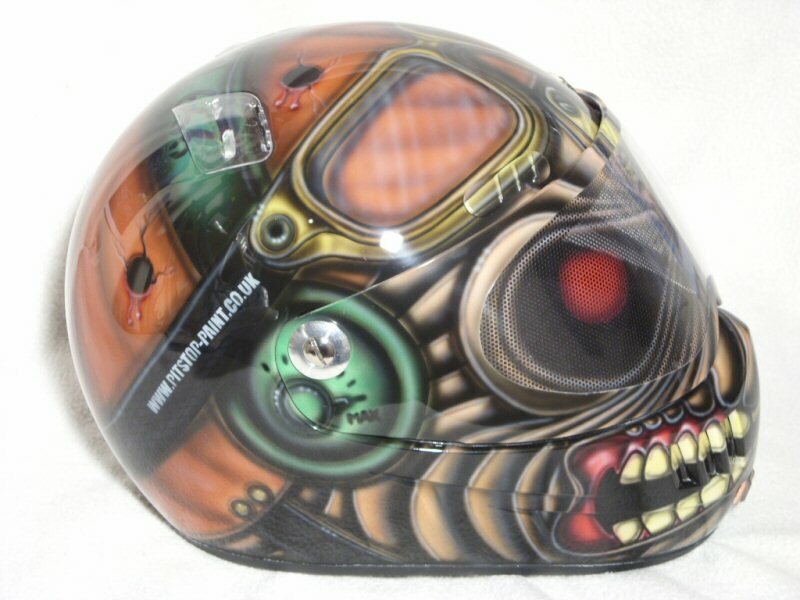 Indian Larry themed helmet done to tie in with a customers harley chop build. Red candy over aluminium flake base featuring 9ct gold leaf murals, etc. 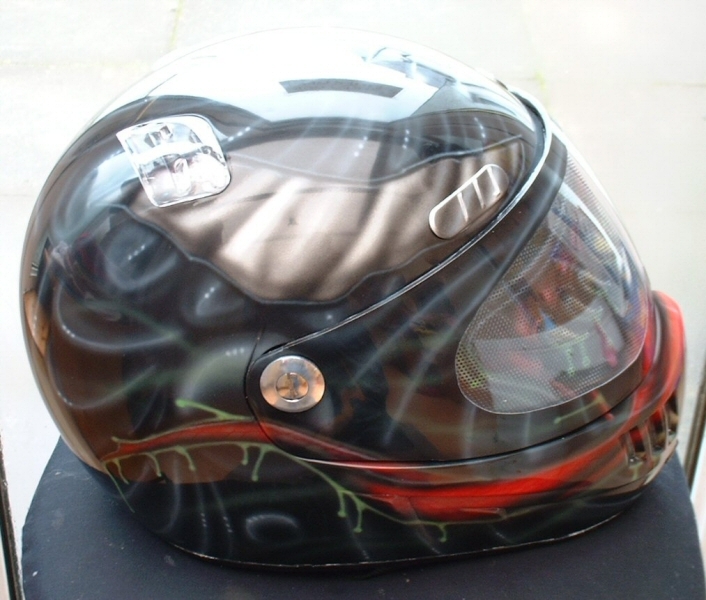 Classy looking custom helmet. Updated version of an old design featuring jaw/skull/brain reveals and small detail right down to veins and maggots, etc. 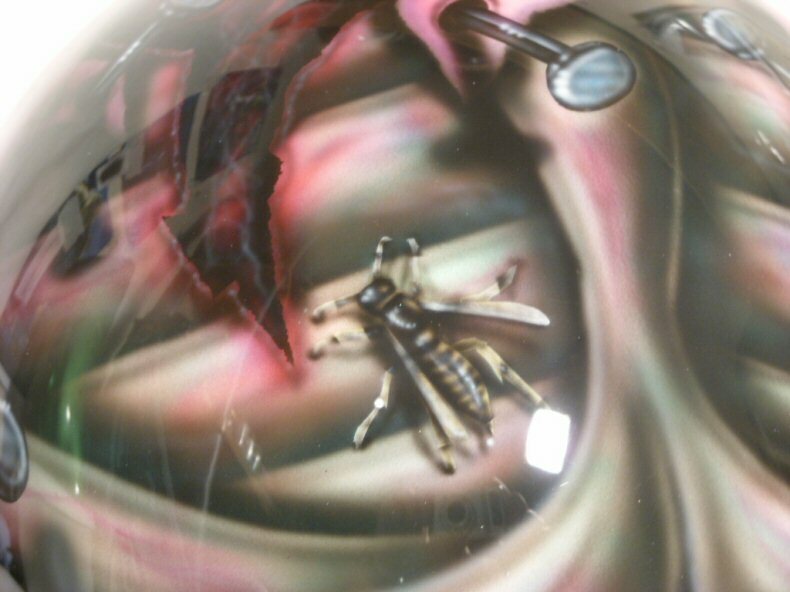 An attention grabbing helmet from a distance with lots of detail close up too. Star Wars themed helmet featuring space battle scenes and some small scale detail work throughout. Something very different and detailed. 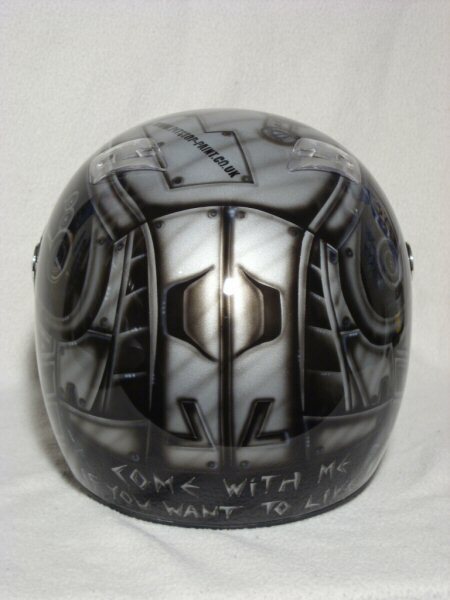 From dusk till dawn themed helmet featuring B&W artwork with some candy orange tints here and there. Subtle neat design. 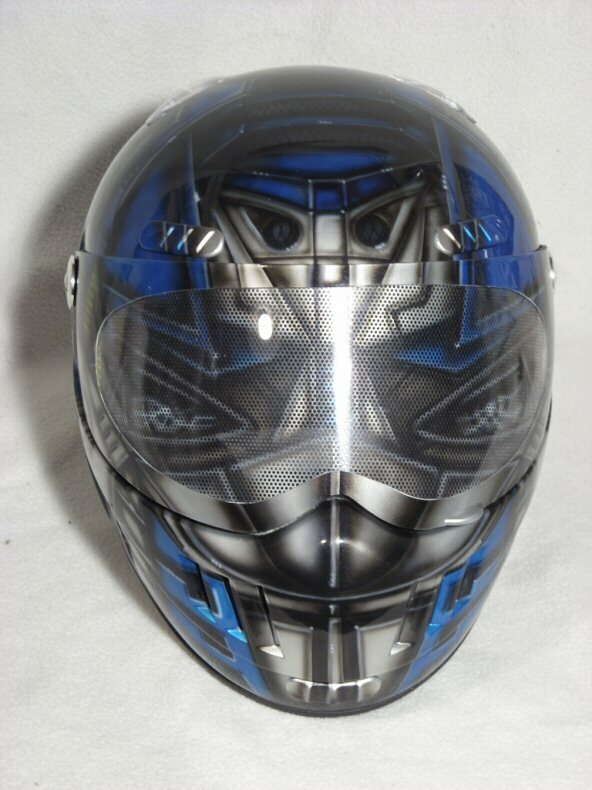 Looked great with the dark visor fitted. 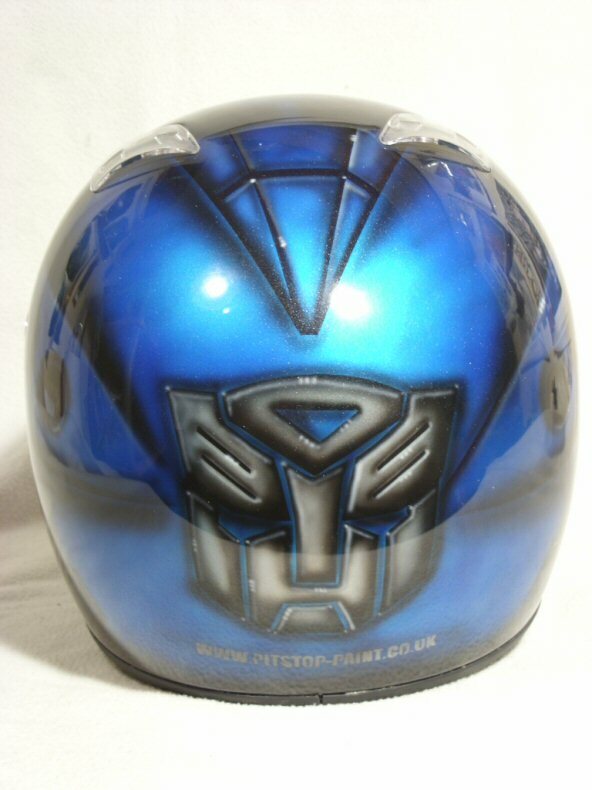 High spec version of the basic Ironman Helmet listed below. Done as a `no holds barred` version to see how far I could take the concept. 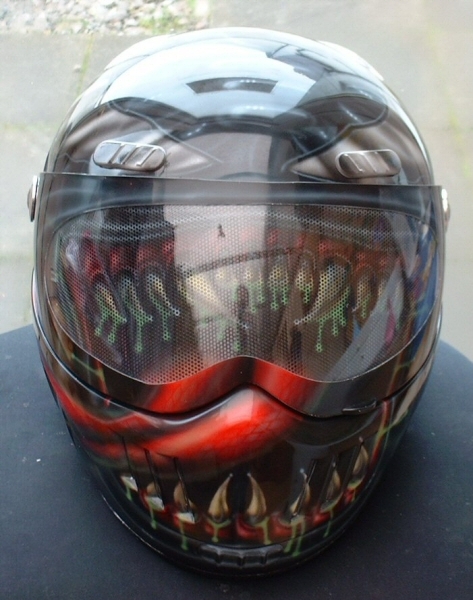 Bandit Alien II helmet chosen specifically for it's ideal shape for this design. Featuring very detailed 3D effects, battle damage, etc and a high detail mural of ironman to the rear. Gold visor insert to match front shield paint. 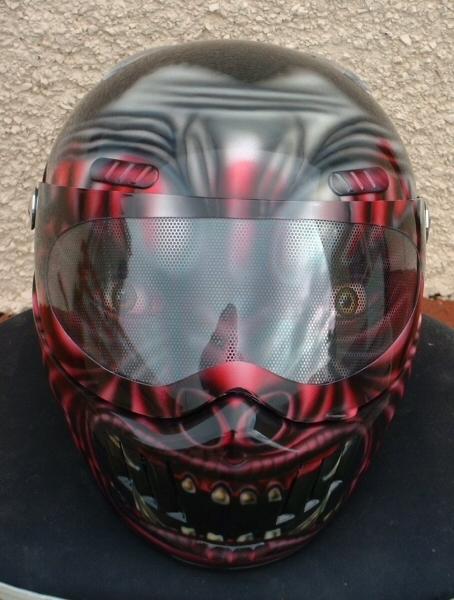 Also so features one-off modified electro-luminescent panels for the eye aperatures which actually light up thanks to a small battery pack hidden in helmets shell/lining. £410 without light up eyes, etc. Can tailor specification to suit your budget basically. 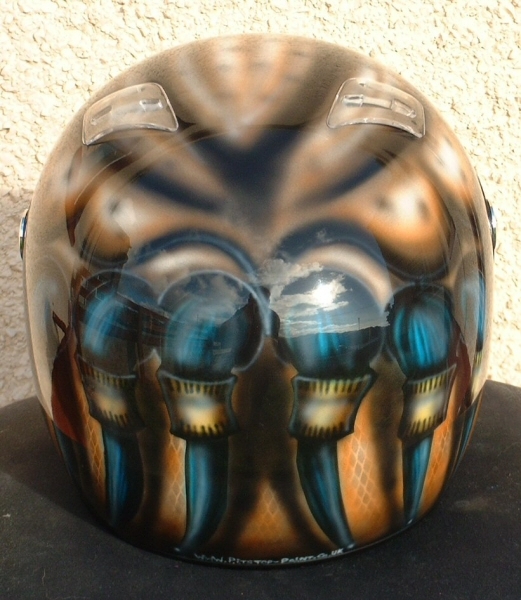 `Son's Of Anarchy` tv show themed helmet with rippled flag front leading to very detailed mural and portrait work on the rear. Detailing everywhere on it. A lot of time and effort in this helmet and a real attention grabber. Serious amount of hours in this design but could do a cheaper/simpler version on request. 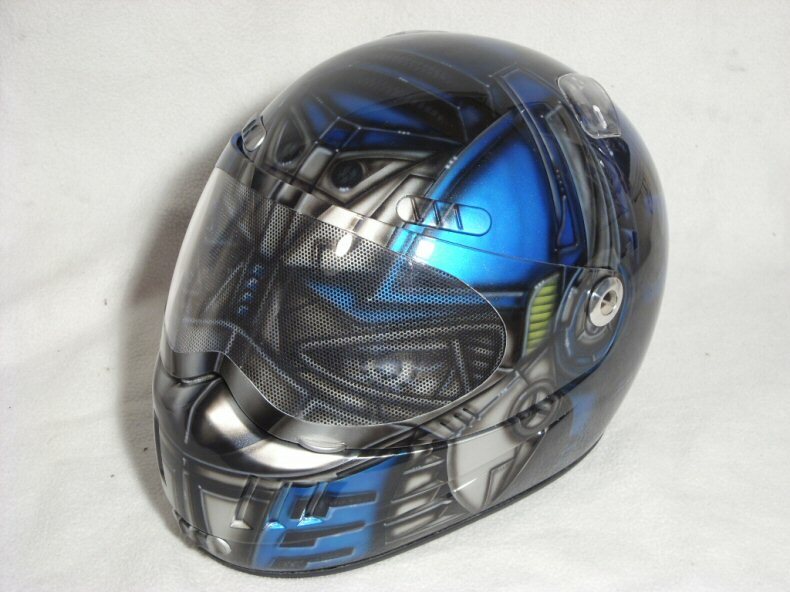 Batman themed helmet featuring face to front and a detailed gotham scene to the rear. Red Dwarf themed helmet done for my wife featuring logo to rear and a space theme using purple and red cnady colouring for a subtle look. Spaceship murals also to sides. Subtle design. Bit of an update on an old design with more detailing, etc, but this time on an open face helmet. Put some red eyes on the flip down visor for a bit of a show effect. Dredd themed helmet to customers design layout featuring battle damage and some sharp 3D effects on the badges, etc. Updated Spiderman dark theme. Sharp design with mesh texture detailing, and spiderman logo to rear. Every bit of webbing shadowed and highlighted. Updated version of classic design. 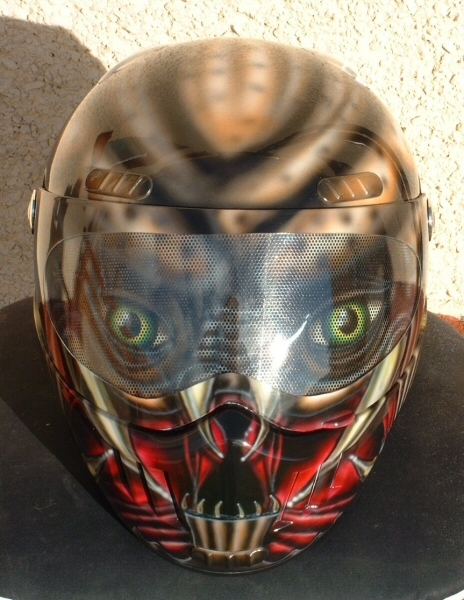 Ultra detailed predator design with tears in battle mask exposing skin/hairs, etc. 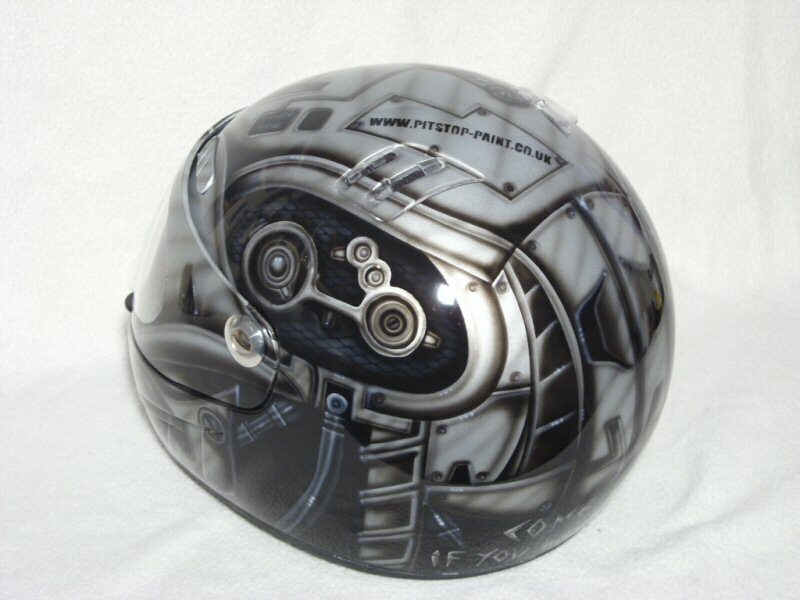 Lots of detail and 3D work throughout such as engraving, etc for a really nice helmet. 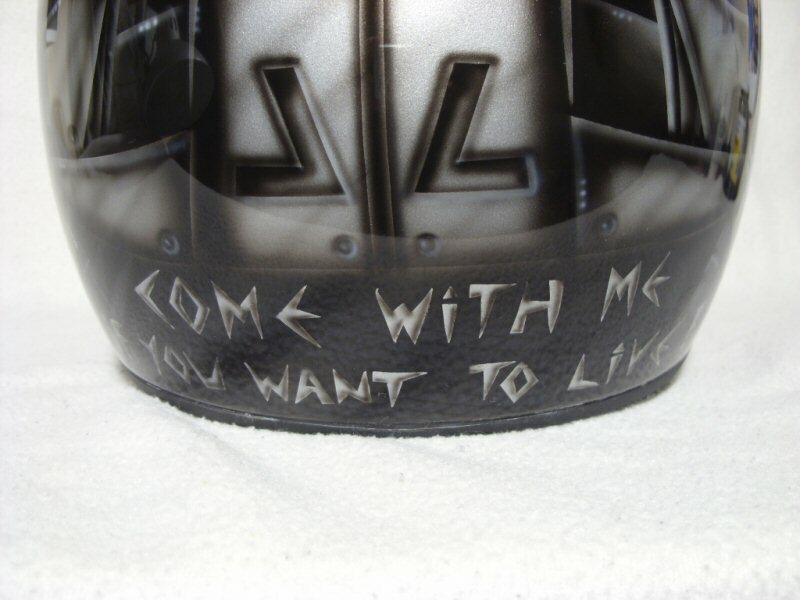 Joker helmet from Batman movies. Face to front and multi layered hair running to detailed rear mural of playing cards. 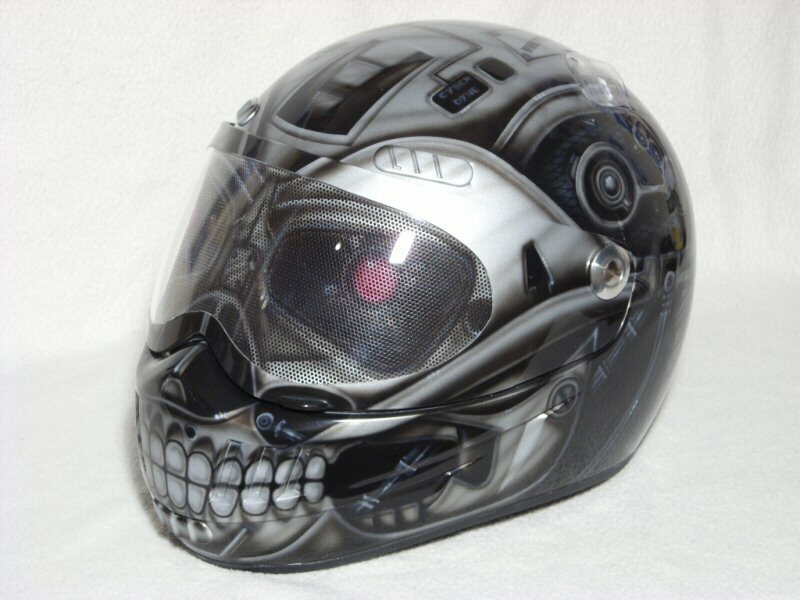 Quite an attention grabbing helmet. 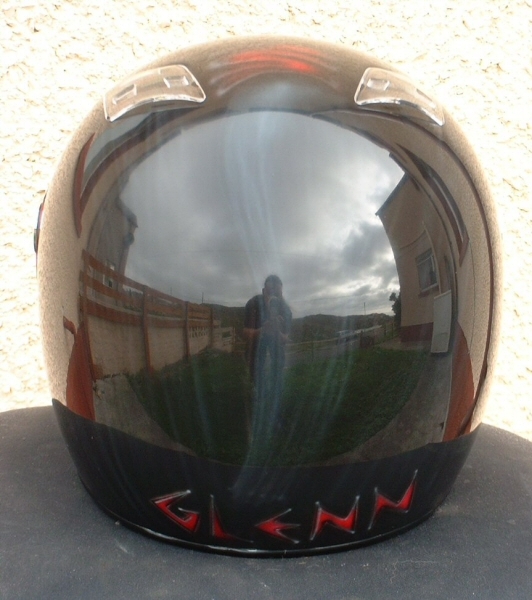 Quick picture of myself wearing it above before sent it to customer to give an idea of effect when worn. New Updated Version of Red Spiderman design over metallic silver base, with stylised chrome webbing and texture effects. Dusting of micro metalflake for rainbow effect sparkle in sunlight. Neat. 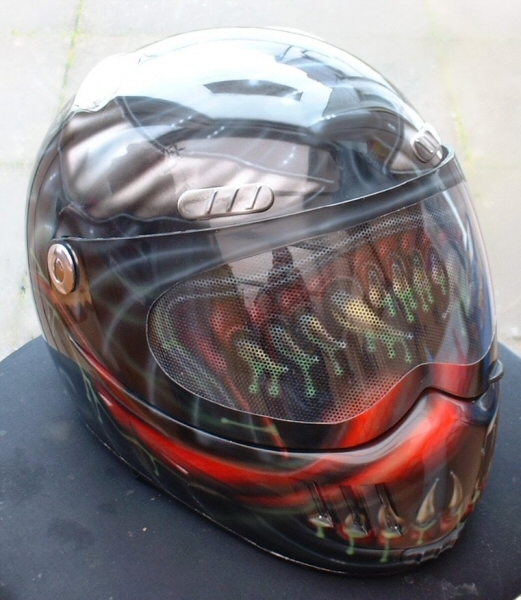 Freddy Krueger themed helmet done in a menacing and mean dark style to really emphasise the movie character. Detailed mural to back, melted skin texturing, blood/muscle, etc with loads of small detailing throughout. Work of art and almost too good to wear. Ironman design done in traditional red/gold. Lots of subtle platework detailing with micro metalflake gold over pearl red base colour. Very sharp looking helmet with some nice touches. Ironman design done in black/gold instead of traditional red/gold at owners request. Lots of subtle platework detailing and gold metalflake through the black to match the gold metalflake of gold sections. Very sharp looking helmet with some nice touches. Owners name/nickmane to rear obviously optional. New version of Incredible Hulk in radioactive green! Great visual impact! Does not make the rest of your body muscular! 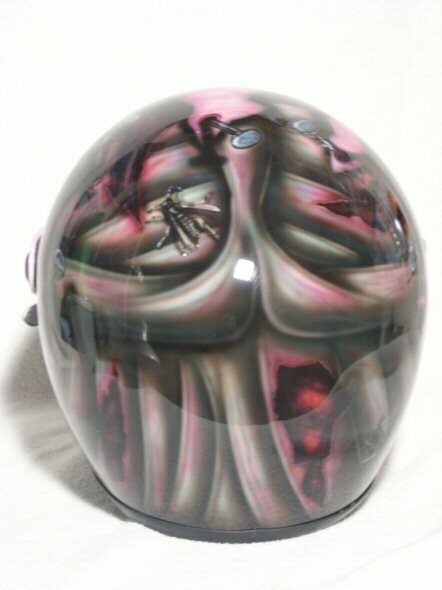 Mixture of spiderman and skull designs to produce this original peice for a valued american client. 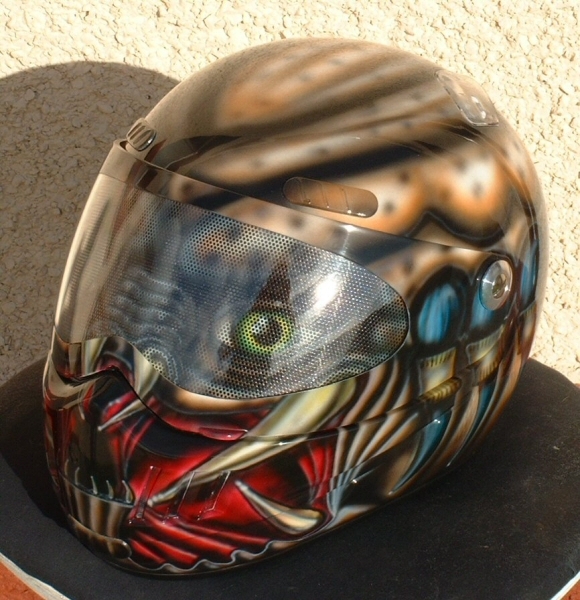 Painted on his own Shoei helmet with a tinted visor as featured in pictures. Classic detailed skull at front with ripped off spiderman mask to rear with ripped fabric thread details, etc, etc. Lots of detail and a really unique peice. New updated version of classic design! Higher level of detail than old version with extra skin texture and fold detailing. More detail everywhere really. Awesome 3D mural to rear! Order yours now. 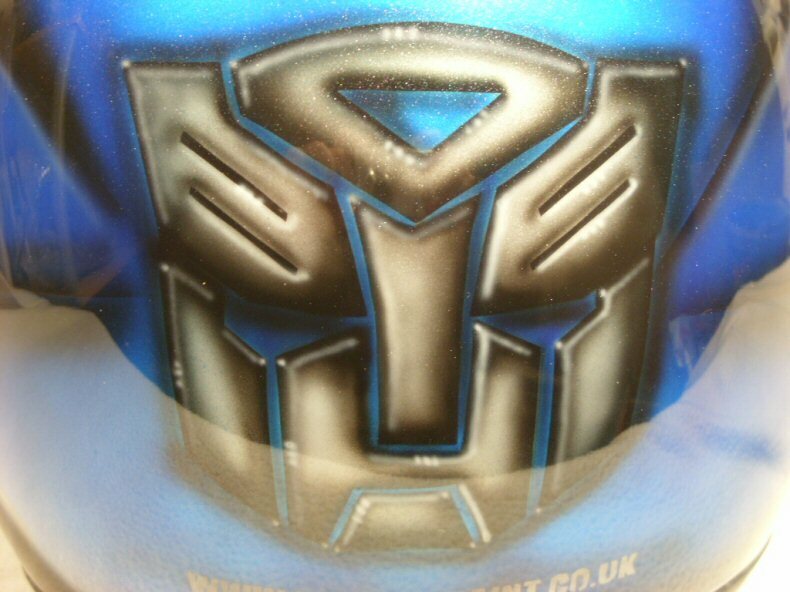 New improved version of Optimus Prime design from Transformers movie. Mega detailed with platework, bio-mech, etc. New version of an classic design. 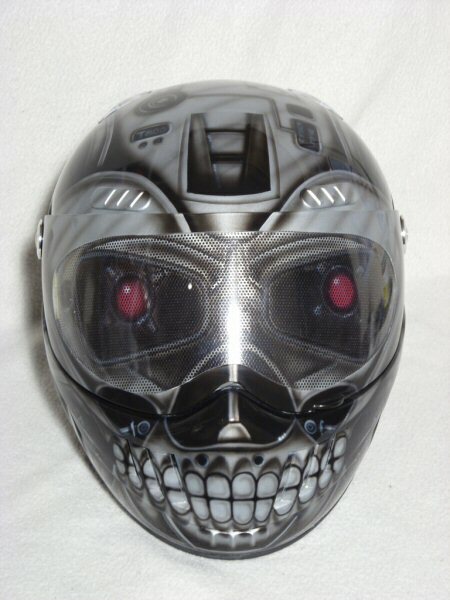 Faithfull replica of the T800 Terminator exo-skeleton. Awesome, just awesome. Fully detailed mechanical and metal work. Detail overkill. Just check out the pictures! New Updated Version of Red and black Spiderman design over metallic silver base, with webbing texture effects. 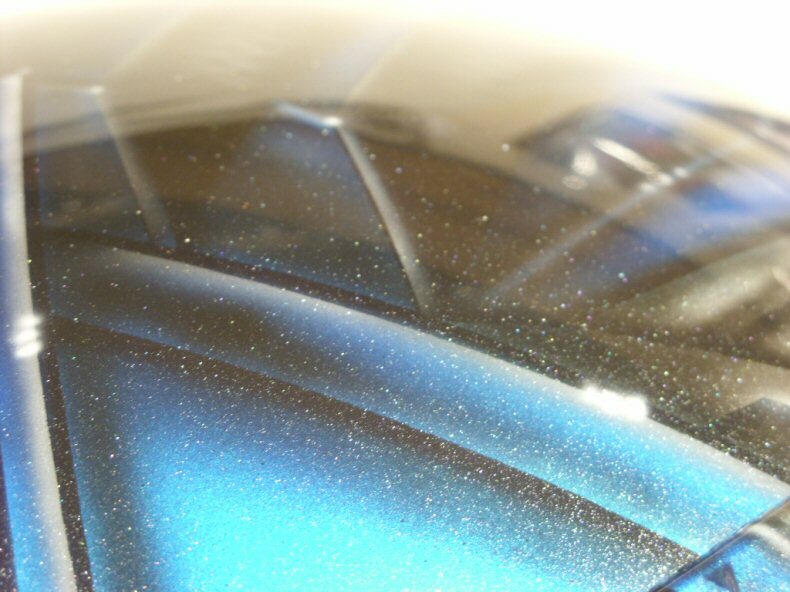 Dusting of micro metalflake for rainbow effect sparkle in sunlight. Neat. Lurtz from Lord Of The Rings movie. Eyes look really menacing! Classic design, but just as popular predator design. Lots of nice detailing. My lids done the same! Venom theme from Spiderman 3 film! Jawdropping design, and one of my favourites! Geiger-esque black/white work with highly detailed mouth area. Check the background detail and drips. NICE! 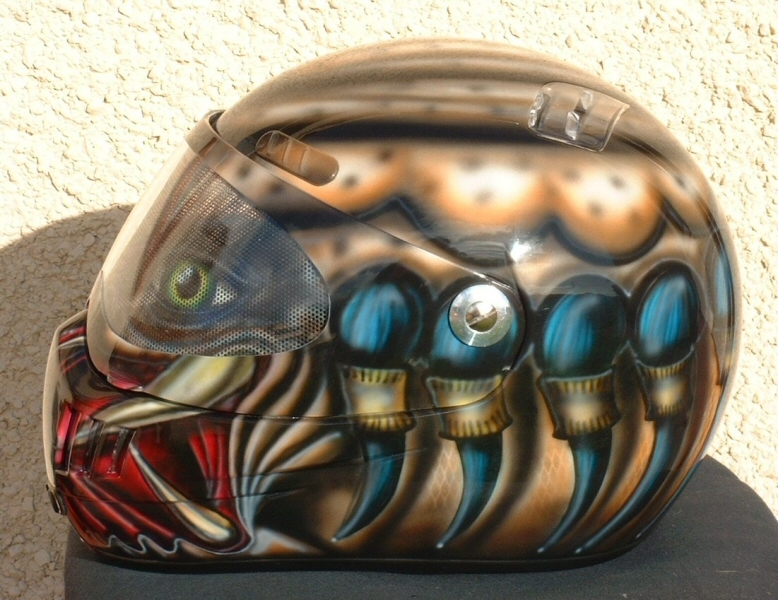 Pocahontas themed helmet done to customers intial ideas/images, but made a bit more `adult` themed . Lots of subtle detail work and a quite subdued overall look to create quite a understated design at first glance. Judge Death theme from the 2000AD comic series! 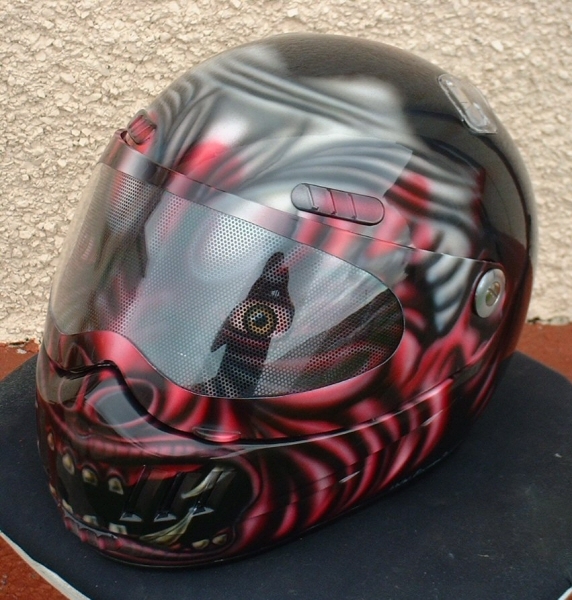 My old helmet, the first helmet I sprayed, and indeed my first attempt at airbrushing!